Home How To How to Flash the Firmware of Huawei E5172? How to Flash the Firmware of Huawei E5172? Unlocking of Huawei E5172 router gateway is possible as I had already mentioned. Recently, in various countries customized firmware, E5172 routers have been released and does not allow to unlock it. This article is dedicated to those persons who are facing problem in unlocking his E5172 devices. 1. Download unlocked firmware of Huawei E5172As-22. 3. Download and install WinRAR 3.80 or a later version in the default installation path C:\Program Files\WinRAR. How to Flash the Firmware of Huawei E5172 4G CPE LTE Router Free? 1. Connect the E5172 to PC and assign the static IP address to the PC network port connected to the HUB to 192.168.1.5. (Refer Image). 2. 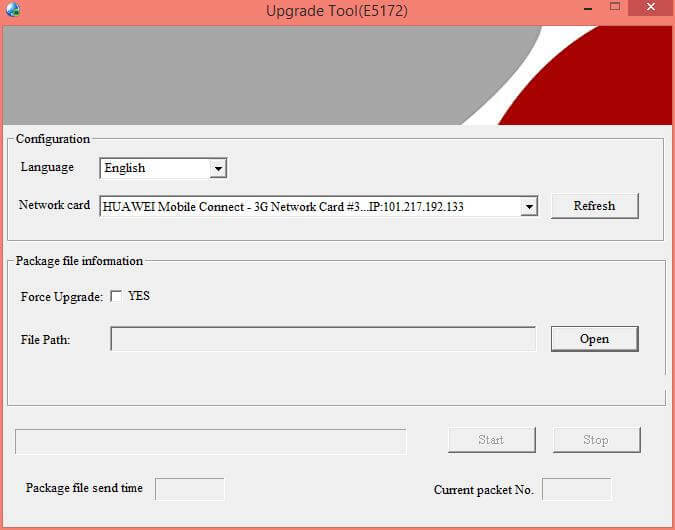 Open the downloaded Huawei E5172 multicast upgrade software. Click on refresh to refresh the network card list, and then select the network card whose IP address is 192.168.1.5. 3. Click Open, and then a dialog box for selecting the upgrade file is displayed. Select the upgrade package E5172.bin, and then click Open. 4. Below the File Path box, if the version number is displayed as the error information such as Error file version… or Analyse time-out…, it indicates that the upgrade package is incorrect. 5. Click Start to start sending multicast packets. 6. After the successful upgrade is complete, all the five signal indicators will be ON on the router. 7. Now, Click Stop to stop sending multicast packets. 8. Close the E5172 firmware upgrade multicast tool. 10. Power off the HUB and enjoy the E5172 CPE router. Now you can easily unlock your Huawei E5172 router with correct unlock code. Next articleHow to Unlock Huawei E5172Bs-925? Thanks.How much time should this take? It has been sending packets for half na hour and nothing happens. is it because the firmware is locked to provider ID?